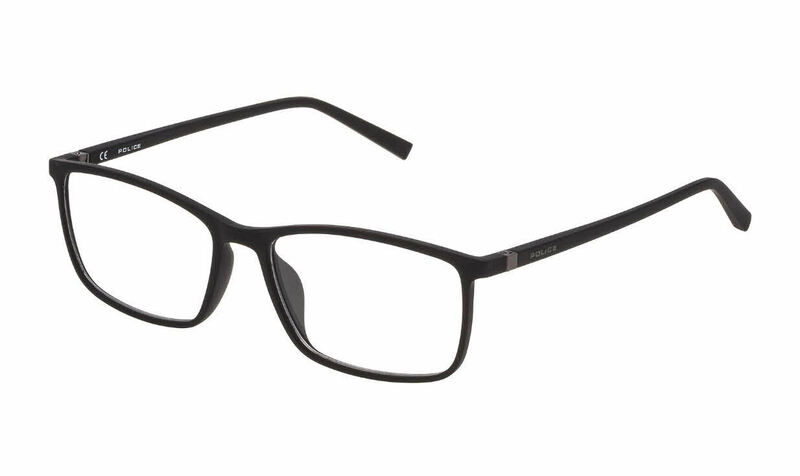 Police VPL255 is a Full Rim frame for Men, which is made of Plastic. Police VPL255 Eyeglasses come with a cleaning cloth and protective carrying case. I am very satisfied with the glasses that were delivered. The lenses (progressive) seem very accurately executed. My only comment is that that process wasnt quite as fast and easy as I expected. I uploaded the photo required for them to create the right focal point on the lenses when placing the order. It appears that photo was never attached to the order even though it was done following the instructions. So, that step had to be redone after the initial order was placed creating, I suppose a day or two delay. There was another follow up about the prescription input into the initial order. It was also not suitable and sent a copy of the prescription card. That computer generated card did not specifically have the plus sign for the positive figures (it just had a negative for the negative values). I was contacted for details of my eye doctor so they could call them to verify. Really? I know they are being careful, but this added many more days to the process and I didn't really want my doc knowing I was trying out an on-line service! At the end of the day, the glasses are fine, and maybe a little cheaper than you can get through a local outlet, but I had a different expectation - I thought this to be like so many Internet services and I would be "wowed" by the savings and quick turnaround. The glasses are fine, but I think I might just continue to use my local doc in the future where the service is one stop.